We are all amazed at the level of destruction and loss of life from the 7.1R last night in Puebla in Mexico looking at this morning's papers. 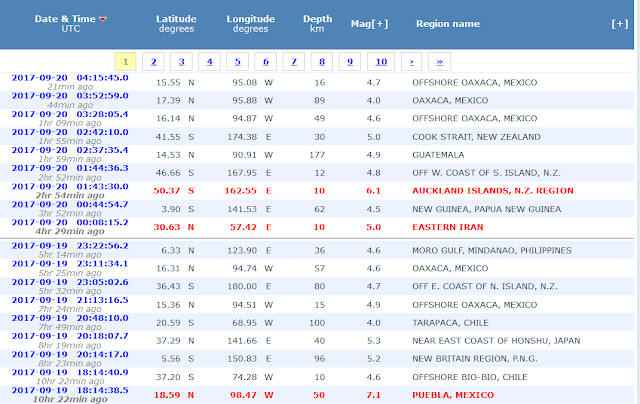 For those of you just waken up the death toll has risen to 149 according to reports. The events there will be unfolding as the day progresses and the damages have been recorded. What is so special today then, lets look up in the sky. If we do we observe a number of things. 1) Heliocentrically the EARTH is SQUARE SATURN. People can ignore squares to Saturn to their peril. 2) Looking from the Earth up now, Geocentrically, we have a) Moon conjunct Sun, (New Moon), 2) Mercury sesquisquare Uranus and 3) Sun quincunx Uranus. New Moon here is a trigger, and the Uranus , Saturn flavor is not nice. 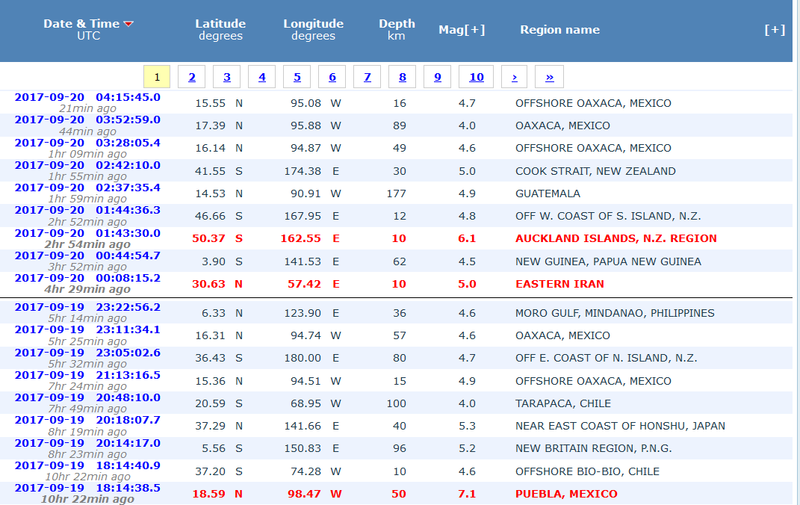 So this morning apart from Mexico Region inc. Guatemala, we have Iran, a 5.0R and New Zealand Region, with Auckland Islands and Cook Strait coming up again in the scene. We will try to update you but as we approach 23rd September I am afraid we are in the time frame of shakes, strong shakes. So, be alert, try to live normally, life goes on, and,... Be Good!